In 2010, US law enforcement arrested around 50,000 undocumented migrants at the border with Mexico. In 2016, the number was over 400,000, among them 75,000 Guatemalans. 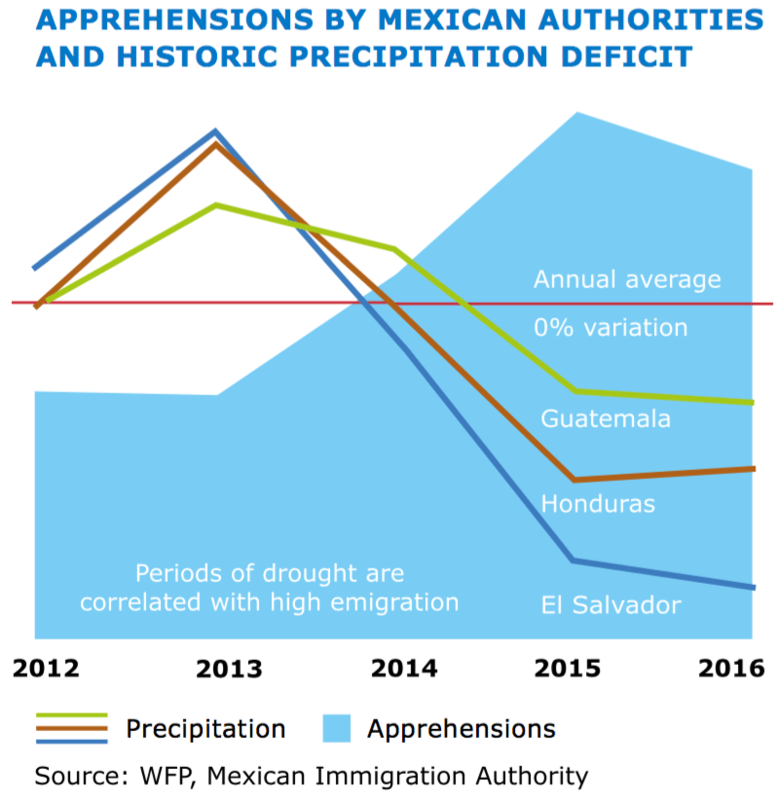 The report determined that “climate change and emigration [from Central America] are strongly linked… challenges stemming from climate variability, poor rainfall distribution and drought, were identified in this study as key push factors for temporary and/or permanent emigration” (p. 16). The report collected data and testimony from hundreds of families of the “dry corridor,” an area home to millions of people that runs through Guatemala, Honduras, and El Salvador and is especially vulnerable to drought. Read more: Water and climate change in Guatemala according to the experts. Surveys in dry corridor communities affected by drought from 2014 to 2016 found that the most common reason for migration to the US was hunger (p. 10). 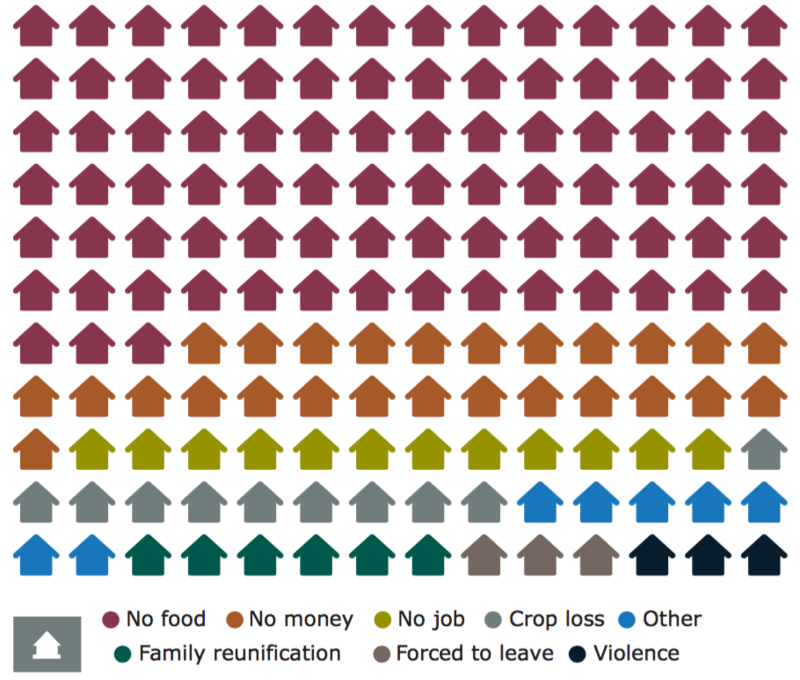 Reasons for emigration in surveyed communities. In 2014, Guatemala lost over 70% of its harvest of basic food staples to drought, according to a 2014 UN report. This directly affected over a million people and raised food prices, especially in the dry corridor, where climate change had already caused massive losses to another principal source of income: the coffee harvest. Higher temperatures favor a fungus called la roya that is devastating coffee plantations throughout Central America. Read more: Guatemala’s water crisis in context. The 2014 drought exacerbated “malnutrition in children under five and women of reproductive age, increasing the risk of social and family conflict and increasing the flow of internal and external migration.” Half of children under six years old in Guatemala suffer from chronic malnutrition, and the proportion in the dry corridor is even higher. In 2015 and 2016, droughts continued to plague the region. In eastern El Salvador, rivers ran 90% lower than normal in 2016. In Honduras, 80% of the harvest in bean-growing areas were lost as was 60% in maize-growing areas. In Guatemala, the UN estimated that 1.5 million people needed humanitarian aid. Food prices have been rising steadily due to unreliable rains and river capture by large plantations, worsening food insecurity. Money sent home from relatives working in the US is increasingly used simply to put food on the table. The August report found that when families throughout the dry corridor receive remittances, they spend most of that money on food (p. 18). In Guatemala and Honduras, “basic needs such as education and medicine rank second, while other investments rank third” (p. 13). These findings illustrate the desperate circumstances that compel many Central Americans to migrate to the US so they can alleviate their families’ poverty by sending money back. A full 78% of migrants from the dry corridor families surveyed for the report sent money at least once a month (p. 18). But remittances don’t always allow families to escape poverty. 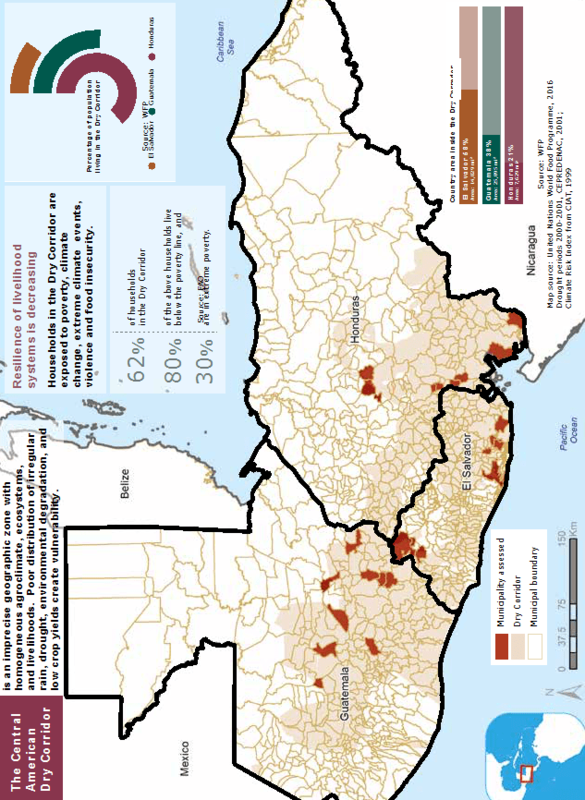 The report estimates that 80% of families in the dry corridor live in poverty and 30% live in extreme poverty (p. 7) even though “in cases of successful emigration, on average 61 percent of [dry corridor families surveyed] receive monthly remittances” (p. 14). Remittances are the only source of fixed income for 42% of the families surveyed. Families may remain impoverished though they receive remittances because they have to pay down debt incurred to migrate. The report states, “Migrant smuggler fees across the region range from US$3,500 up to US$15,000” (p. 14). The report explains, “When funds to emigrate come from loans or sale of properties and assets, then debts, mortgages and economic scarcity lands on the relatives who stay behind. Their economic situation is negatively impacted and may become aggravated over time, when they receive little by way of remittances or any other assistance…. Acquired emigration debts have to be repaid, independently of whether the emigrant successfully reached the intended destination and engaged in gainful activities or not” (p. 17). Every year, hundreds of migrants from the dry corridor die in Mexico or US deserts, and tens of thousands are deported. This forces families with migration debt further into poverty. The report summarizes, “Food insecurity, seen by the population as the inability to bring food to the table, can trigger the decision to emigrate. Moreover, the family members who stay behind can go through a period of aggravated problems to cover their food needs because they lost a food provider, they are indebted and, in the case of those who are deported or die during the journey, the crisis can extend and even lead to losing the family livelihood” (p. 17). The report was published by the United Nations World Food Programme (WFP) Regional Bureau for Latin America and the Caribbean, with the participation of the International Organization for Migration (IOM) and the Inter-American Development Bank (IDB) and the collaboration of the International Fund for Agricultural Development (IFAD) and the Organization of American States (OAS). How do Central Americans experience corruption?